Pretty Little Liars returns to ABC Family tonight with an all new Tuesday August 4, season 6 Episode 9 called “Last Dance,” and we have your recap and spoilers below. On tonight’s episode, the girls are prohibited from attending the prom because they’re deemed a security risk, so their moms organize a home prom in Spencer’s [Troian Bellisario] barn. Meanwhile, Charles plans to make the festive evening a memorable night. On the last episode, after their latest run-in with Charles, tensions were at an all-time high with the PLLs and the town of Rosewood. Aria’s big moment of seeing her work displayed in an art gallery was in jeopardy as Ella was determined to keep her safe at home. Hanna was still uncomfortable with the unexpected scholarship money and was determined to give it back, even if that meant ruining her chances at going to her school of choice. And to top it off, the one normal high-school rite of passage the girls were looking forward to was in danger as Rosewood High was considering not letting the PLLs attend prom due to security issues. Did you watch the last episode? If you missed it, we have a full and detailed recap right here for you. Tonight’s episode of Pretty Little Liars kicks off with Spencer at The Brew with the liars, they are all upset because Rosewood isn’t letting them go to their senior prom – they say it is a safety issue. Spencer’s mom Veronica has agreed to let them have their own private prom in the barn that Melissa used to live in. And, it gets worse – Rosewood has also banned them from attending their high-school graduation speech, they are afraid Charles DiLaurentis will try to make a move on them at the big events. The liars are devastated – Alison doesn’t seem to upset though, she points out that they don’t have any real friends at Rosewood any way beside each other. Ezra overhears Aria leaving Clark another message, he lectures her and tells her that she should let the police handle it. Aria’s mom rushes in – she got an email from the art contest, and despite Charles’s meddling, she won first prize. She gets a cash prize and there is an internship waiting for her in Los Angeles, she leaves a week after graduation. Hanna heads to Caleb’s and he is packing his car up – he says that he is heading to New York to see his dad. Hanna isn’t buying it, she notes that Caleb is taking one of his industrial strength laptops. Meanwhile at Emily’s house she invites Sarah to be her prom date at their prom in the barn – Sara explains that she is going to the prom at her old high-school and apologizes that she can’t make it. Toby is getting suspended for being high as a kite and eating Spencer’s pot candy. He rushes to the police station to clear up the confusion but Toby won’t let her in, and tells her it is for the best. Lorenzo joins them and he is obviously not a fan of Spencer, he tells her that the police don’t care about anything that she has to say. At Hanna’s house she is freaking out, she called Caleb’s dad and h is not on the way to New York, he lied to her, she is convinced that he is going to hunt down Charles himself. Spencer runs in to Lorenzo again at The Brew, she begs hi to forgive Alison. Spencer swears that Alison didn’t use him just to get the key card and she honestly cares about him. Spencer thinks that Alison really does need him, Lorenzo isn’t trying to hear it – he says that there is no way he could forgive her any time soon. Spencer tells Lorenzo that if he changes his mind he is invited to the prom at the barn. It’s time for the liars’ big prom in the barn – all of their mothers are inside the Spencer house drinking with Veronica. Alison arrives at the barn and waves to everyone’s moms – and then rushes in to the woods, she is sneaking off to meet up with Charles. Inside the barn the other liars are decorating for prom, and Hanna is following Toby around begging him to find out where Caleb is. Alison sneaks in to Rosewood’s real prom at the high-school, because that is where Charles told her to meet them. Meanwhile, the liars are all sitting in the barn on their cell phones and looking at pictures from the real prom. They spot Alison in the background of one of the pictures – they realize that she ditched them and went to real prom, and she could be in serious danger. The liars sneak off to prom to find Alison – Aria is shocked to see Clark there taking photographs, he says someone on the prom committee hired him. Aria demand to know why he was meeting Rhys, but one of the teachers interrupts and tells Aria that she and her friends need to leave. Meanwhile, Alison is still receiving texts from a blocked number, and they tell her to look for someone in red. She rushes through the crowd and the liars continue to look for her. Meanwhile back at the Hastings house, Veronica is wasted and spilling all of the beans to the other liars’ moms. She rants that the “deranged freak” tried to frame their entire family. Emily’s mom thinks they might have it all wrong. She thinks that Charles didn’t kill Alison’s mom – maybe their dad Kenneth did because she was hiding Charles and visiting him. Veronica grabs her keys and announces that she is going to go talk to Alison’s dad and get a real answer. Spencer, Emily, and Hanna confront Alison – she begs them to leave her alone, she is afraid that they are going to blow it with Charles like they did at the arcade. Sara arrives and Emily is shocked to see her – she says she stopped by the barn and it was empty and she came to find Emily. She wanted ot have at least one good prom dance. Drunk Veronica and the other moms head in to the DiLaurentis house, they can’t find Alison’s dad anywhere but his car is in the driveway. They find a photo on the coffee table, it’s of Charles, Jason, and their mom when they were little boys. Suddenly they hear a noise behind them, it’s Rhys Matthews! At prom Caleb shows up, Hanna is shocked to see him. She demand to know what he was doing in New York. Caleb tells Hanna that they can talk after they have one real dance. Ezra dances with Aria, he reveals that he is leaving for Thailand and going on a Habitat For Humanity trip. Spencer dances with Toby, and they discuss what she would have said in her graduation speech, had she been allowed to read it. Spencer panics, she looks up and realizes that Alison is gone. At the DiLaurentis house Rhy says that he came from the Carassimi Group and needs to discuss business with the DiLaurentis Family – because Mrs. DiLarentis used to donate money. He leaves, and Ella says that she thinks they just met Charles. They hear a noise coming from the basement and they head downstairs to investigate. Someone slams the door behind them and locks it – the liars’ moms are all officially locked in the basement. Alison spot someone walking around in a red hood and she rushes to follow them out the door. When Caleb and Hanna are done dancing, Caleb reveals that the reason he was in New York was for a job interview. He got some sort of top secret anti-hacking job with a contract, and he is going to make enough money for them both to move to NY, live there, and pay for Hanna’s tuition. 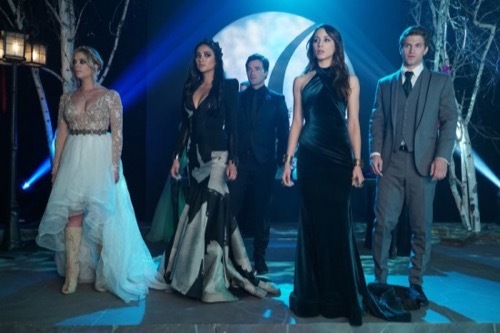 The liars see Alison leaving prom and they chase after her, and Clark chases after her – Toby and Caleb tackle Clark and realize that he has a gun. Clark pulls out a badge and reveals that he has been an undercover police officer this whole time. He tells them to get off from him so that he can go do his job. Clark rushes off, and Aria is in shock – she can’t believe the entire time they were hanging out, he was actually just befriending her to get information. Alison is outside of prom in the dark walking through trees decorated in twinkle lights – she finds a red cape hanging from the tree, and then realizes that she is surrounded by mirrors and the cape is empty. She receives a text message that says “now it is just the two of us,” then someone tackles her from behind and covers her mouth and begins dragging her away.